The event includes dinner, drinks and a special planetarium presentation relating the Greek myths of love, romance and seduction to objects in the night sky. This year we decided to add dancing under the stars following the planetarium presentation. Dinner for the evening will start with a vegetarian antipasti course followed by Cornish hens with an apricot glaze. For desert there is an option of either rich chocolate layer cake with a raspberry sauce or NY style cheesecake with strawberry sauce. The cost for the event is $140 per couple for dinner seating in the planetarium lobby. If you so choose, you can have dinner in the planetarium under the stars for $165 per couple. Reservations are required and can be made by contacting me. If you register with friends, we will endeavor to seat your party at the same table for dinner. The event starts at 7:00 with dinner around 7:30. The evening will wrap around 10:00 pm. You must be at least 21 to attend. And, for your Valentine's Day knitting enjoyment, you can make a treat for the fuzzy someone in your life. 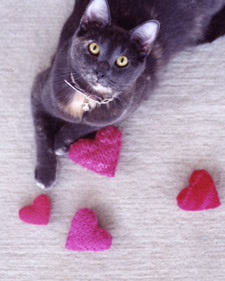 Martha Stewart has posted a knitted heart-shaped catnip toy pattern on her site.